#1. This week's number one is an experienced international guard Michael Efevberha (193-84, agency: Octagon Europe, college: CS Northridge, currently plays in Lebanon). He led Homentmen to a victory over the closely-ranked Hoops Club (4-7) 87-71 in a derby game in the Lebanese LBL last Thursday. Efevberha was MVP of the game. He recorded 28 points (!!!) and blocked 3 blocks. Homentmen Beirut (9-2) is placed third in the LBL. It was his team's third consecutive victory in a row. There are only two games left until the end of the Regular Season. So now every game will be critical. Efevberha has individually a very good season with high stats. He averages: 21.1ppg, 4.4rpg, 1.8apg, 1.6spg, 2FGP: 48.2%, 3FGP: 52.9%(37-70). Efevberha has a dual citizenship: Nigerian and American. He is currently a member of the Nigerian senior national team. #2. Second place goes to former international forward Melvin Ejim (201-91, college: Iowa St., currently plays in VTB United League). 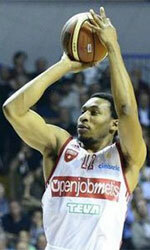 He could not help Unics Kazan (11-3) in their last game on Saturday. Despite Ejim's good performance Unics Kazan was defeated 91-85 on the road by the lower-ranked BC Nizhny Novgorod (#7). He recorded a double-double by scoring 14 points and getting 10 rebounds. Ejim's overall stats this season are: 7.8ppg, 6.8rpg, 2FGP: 47.8%, 3FGP: 25.0% and FT: 81.3%. He is another player who holds two passports: Canadian and Nigerian. Ejim played for the Nigerian national team in 2012. #3. The Nigerian player who performed third best last week abroad was an international power forward Christopher Obekpa (208-93, college: UNLV, currently plays in Lebanon). Obekpa was not able to help Al Riyadi (9-2) in their last game on Friday. Despite his good performance the league leader Al Riyadi was defeated 85-75 in Dik El Mehdi by the second-ranked Champville. Obekpa was the second best scorer with 11 points. He also added 7 rebounds and made 3 blocks. Obekpa's team will play only one more game in the Regular Season. And now that game is very crucial. It's Obekpa's first season with the team. He has relatively good stats this year: 12.0ppg, 8.8rpg, 2.8bpg, 2FGP: 73.3%(22-30). Obekpa is also a member of the Nigerian senior national team. #4. Forward Al-Farouq Aminu (206-90, college: Wake Forest, currently plays in NBA) contributed to a Portland Trail Blazers' victory against the Atlanta Hawks (16-34) 120-111 in the NBA last Saturday. He scored 17 points, grabbed 8 rebounds and dished 4 assists (was perfect 7-for-7 from the free throw line). The Portland Trail Blazers have a solid 32-20 record this season. It was his team's third consecutive victory in a row. Aminu is one of the most experienced players in a team as it's his fourth year in Trail Blazers' roster. This season Aminu has relatively solid stats: 9.5ppg, 8.1rpg and 1.2apg. He has both American and Nigerian nationalities. Despite Aminu played previously for the USA U19 national team, he is currently in the Nigerian national team roster. #5. Former international power forward Suleiman Braimoh (203-89, college: Rice, currently plays in Israel) was the main contributor in a Hapoel Eilat's victory against the closely-ranked Rishon (8-8) 96-81 in the Israeli Winner League on Sunday night. Braimoh was the best player in that game. He recorded 19 points and grabbed 4 rebounds in 26 minutes. Hapoel Eilat (11-5) is placed third in the Winner League. Braimoh has very impressive stats this year: 15.8ppg, 5.3rpg, 1.8apg and 1.4spg in 12 games he played so far. He also holds two passports: Nigerian and American. Braimoh used to play for the Nigerian national team three years ago. #6. Forward Abdullahi Kuso (206-84, college: Tallahassee CC, currently plays in Japan) was the major contributor in Gunma's victory against the fourth-ranked Orange Vikings (14-21) crushing them 85-56 in the Japanese B2 League in Saturday night's game. He recorded 20 points and grabbed 9 rebounds in 29 minutes. Gunma Crane Thunders (25-10) are placed first in East group. Kuso has very impressive stats this year: 15.2ppg, 10.7rpg, 3.1apg, 2.2bpg and 1.3spg in 34 games. He is a former international player as he played for the Nigerian senior team twelve years ago. #7. Former international power forward Trevor Mbakwe (207-89, agency: Pensack Sports, college: Minnesota, currently plays in Japan) was not able to secure a victory for Osaka Evessa (14-22) in their game against Toyota Alvark (24-12) in the Japanese B League. Despite his very good performance last Saturday Mbakwe was the second best scorer with 20 points. He also added 9 rebounds and 3 assists. Mbakwe's overall stats this season are: 9.0ppg, 7.3rpg and 3.3apg. He holds both American and Nigerian passports. Despite Mbakwe played previously for the USA university national team, he is currently in the Nigerian national team roster. #8. Guard Obi Emegano (190-93, college: ORU, currently plays in Basketball Champions League) couldn't help JDA Dijon (5-8) in their game against Antwerp Giants (6-7) in the Basketball Champions League, despite his good performance last Tuesday. Emegano was the second best scorer with 10 points. He also added 4 rebounds in 24 minutes. But the fifth-placed JDA Dijon (5-8) lost 63-67 in Antwerp to the higher-ranked (#4) Giants in the group C of Basketball Champions League. Emegano's team will play only one more game in the Basketball Champions League Regular Season. And now that game is quite important. This year Emegano's overall stats are: 8.3ppg, 3.1rpg and 1.1spg in 13 games. He plays currently for the Nigerian national team. #9. International swingman Stan Okoye (198-91, college: VMI, currently plays in Spain) helped Zaragoza win their n overtime game against the league outsider Gipuzkoa (3-15) 78-73 in the Spanish Liga Endesa in Saturday night's game. He scored 12 points and grabbed 4 rebounds in 33 minutes. Tecnyconta Zaragoza (9-9) is placed tenth in the Liga Endesa. Okoye has reliable stats this year: 14.0ppg, 4.4rpg and 1.1apg in 16 games. He holds both American and Nigerian passports. Okoye is also in the roster of the Nigerian national team. #10. Power forward Gani Lawal (206-88, also represented by Octagon Europe, college: Georgia Tech, currently plays in Japan) couldn't help Shiga L-Stars (8-28) in their game against Hitachi Sunrockers (16-20) in the Japanese B League. Despite his very good performance last Sunday He recorded a double-double by scoring 25 points and getting 20 rebounds. This season Lawal has very high stats. He averages: 20.6ppg, 12.2rpg, 1.7apg and 1.5bpg. Lawal holds both American and Nigerian passports. He is a former international player as six years ago he still played for the Nigerian senior national team. #11. International center Jeleel Akindele (216-83, agency: BeoBasket, college: Chicago St., currently plays in Mexico) helped Fuerza Regia win their game against the seventh-ranked Huracanes crushing them 90-69 in the Mexican LNBP (second division) last Sunday. Akindele scored 9 points and grabbed 7 rebounds in 19 minutes. Akindele has very impressive stats this year: 18.4ppg, 8.9rpg and 2.5apg in 31 games. He plays currently for the Nigerian national team. #12. International guard Keith Omoerah (194-92, agency: Interperformances, college: Manitoba, currently plays in Ukraine) couldn't help Mykolaiv in their game against Khimik in the Ukrainian Superleague. Despite his very good performance on Thursday night Omoerah was the second best scorer with 15 points. He also added 6 rebounds and dished 3 assists. Omoerah averaged so far 13.4ppg, 6.9rpg, 3.0apg and 1.1spg. He is also in the roster of the Nigerian national team. #13. Former international small forward Thanasis Antetokounmpo (199-92, currently plays in Euroleague) managed to help Panathinaikos Superfoods Athens to win against the fourth-ranked Anadolu Efes 88-75 in the Euroleague last Friday. Antetokounmpo scored only 4 points. Antetokounmpo's total stats this season are: 4.8ppg and 1.6rpg. He used to play for the Nigerian national team three years ago. #14. Former U22 international power forward Dinma Odiakosa (203-85, college: Illinois St., currently plays in France) helped Sluc Nancy win their game against the tenth-ranked Nantes 79-68 in the French ProB (second division) last Friday. Odiakosa recorded 12 points and grabbed 9 rebounds in 29 minutes. This year Odiakosa's total stats are: 6.9ppg and 6.4rpg in 16 games. He used to play for the Nigerian U22 national team back in 2004. #15. International forward Jordan Nwora (203-98, currently plays college basketball in the States) helped Louisville win their game against the Wake Forest University crushing them 82-54 in the NCAA in Wednesday night's game. Nwora recorded 20 points and grabbed 6 rebounds in 30 minutes. Nwora has very impressive stats this year: 18.2ppg, 7.7rpg, 1.6apg and 1.1spg in 21 games. He holds both American and Nigerian passports. Nwora is also in the roster of the Nigerian national team. #1. Giannis Antetokounmpo (211-G/F-94, agency: Octagon Europe, currently plays in NBA) led Milwaukee Bucks to a victory over the Charlotte Hornets (24-26) 108-99 in the NBA in Friday night's game. He was MVP of the game. Antetokounmpo had a double-double by scoring 34 points and getting 14 rebounds. He also added 3 assists, 3 blocks and 3 steals in 38 minutes. The Milwaukee Bucks have a solid 37-13 record this season. It's Antetokounmpo's sixth year with the team. Antetokounmpo has individually a very good year with high stats. He averages: 26.4ppg, 12.6rpg, 5.9apg, 1.4bpg and 1.5spg in 47 games he played so far. Antetokounmpo has a dual citizenship: Greek and Nigerian. #2. Tonye Jekiri (213-C-94, college: Miami, FL, currently plays in Turkey) could not help Gaziantep (8-7) in their last game. Despite Jekiri's very good performance Gaziantep was edged 65-62 at home by the lower-ranked (#9) Darussafaka. He had a double-double by scoring 16 points and getting 13 rebounds. Jekiri also added and 3 steals in 37 minutes; quite an impressive performance considering it's only his third season in pro basketball. It was Gaziantep's first loss after consecutive victories. It's Jekiri's first year with the team. Jekiri has relatively good stats this season: 11.9ppg, 10.7rpg and 1.5apg in 15 games. #3. Danny Agbelese (206-F/C-90, also represented by Octagon Europe, college: Hampton, currently plays in Greece) was the major contributor in Holargos' victory against the league outsider Kolossos HH (2-12) 81-75 in the Greek A1 last Saturday. He had a double-double by scoring 18 points and getting 10 rebounds. Agbelese also added 5 blocks in 23 minutes. Holargos B.C. (8-7) is placed seventh in the A1. This year Agbelese's overall stats are: 8.3ppg, 7.5rpg and 1.9bpg in 15 games. He is another player who holds two passports: Nigerian and American. #4. Micheal Eric (210-C-88, college: Temple, currently plays in Euroleague) contributed to Darussafaka's surprising victory against the eighth-ranked Baskonia (10-11) 80-75 in the Euroleague in Friday night's game. He scored 18 points, grabbed 5 rebounds and made 2 blocks in 25 minutes. Darussafaka Istanbul (3-18) is located at the very bottom in the Euroleague. This year Eric has relatively solid stats: 11.4ppg and 5.2rpg in 21 games. #5. Abdul-Malik Abu (203-F-95, college: NC State, currently plays in Croatia) was not able to help KK Vrijednosnice Osijek (6-7) in their last game on Friday. Despite his very good performance KK Vrijednosnice Osijek was defeated 79-66 on the road by the one of league's weakest teams KK_Skrljevo (#11). Abu recorded a double-double by scoring 19 points and getting 10 rebounds. Abu has reliable stats this season: 15.0ppg, 8.6rpg and 1.2apg. #6. Ike Joseph Udanoh (203-PF-89, college: Wayne St., MI, currently plays in Italy) contributed to a MIA-RO Cantu's victory against the closely-ranked Dolomiti En. TR 97-92 in the Italian Serie A last Sunday. He scored 18 points, grabbed 8 rebounds and dished 3 assists in 38 minutes. Udanoh has reliable stats this year: 13.1ppg, 8.9rpg, 4.1apg and 1.9spg in 16 games. He has both American and Nigerian nationalities. #7. Michael Ojo (216-C-93, college: Florida St., currently plays in ABA League) was not able to secure a victory for Crvena Zvezda (16-1) in their last game on Saturday. Despite his good performance the league leader Crvena Zvezda was badly defeated 84-68 in Zagreb by the second-ranked Cedevita. Ojo scored 10 points (was perfect 6-for-6 from the free throw line). Ojo's overall stats this season are: 7.8ppg and 5.9rpg. Worth to mention Ojo played also at Eurobasket Summer League, which helped him get the job in pro basketball. #8. Michael Fakuade (201-F-89, college: Ill.-Springfield, currently plays in France) helped Entente Orleans 45 edge the closely-ranked JA Vichy 97-96 in the French ProB (second division) on Friday night. Fakuade had a double-double by scoring 22 points and getting 12 rebounds in 33 minutes. Fakuade has reliable stats this year: 13.0ppg, 7.3rpg, 1.5apg and 1.1bpg in 15 games. He also holds two passports: Nigerian and American. #9. David Kadiri (200-F-95, college: Buffalo, currently plays in Serbia) helped Sloboda Uzice edge the closely-ranked Novi Pazar 99-98 in the Serbian KLS in Sunday night's game. Kadiri scored 16 points and grabbed 4 rebounds. Kadiri's overall stats this season are: 8.9ppg, 4.3rpg and 1.1apg. He holds both American and Nigerian passports. #10. Enuoma Ebinum (206-F-94, college: Bowie St., currently plays in Denmark) helped Svendborg win their game against the fifth-ranked Randers 91-82 in the Danish BasketLigaen on Thursday night. Ebinum scored 22 points, grabbed 9 rebounds and made 2 blocks. Ebinum has reliable stats this season: 10.7ppg and 4.4rpg.